When Roy and I are lucky enough to visit Jenn in sunny Southern California, she makes sure that the restaurants we go to for dinner have a great views of the ocean. Each time I am amazed at how long surfers and other people linger on the beach as it gets dark. They all seem to want to eek out every possible moment of daylight and I love watching them against the sunset. When we were there this spring, she took us to a place that not only overlooked the shore; it also had great food. It was in Del Mar and called Jake's. 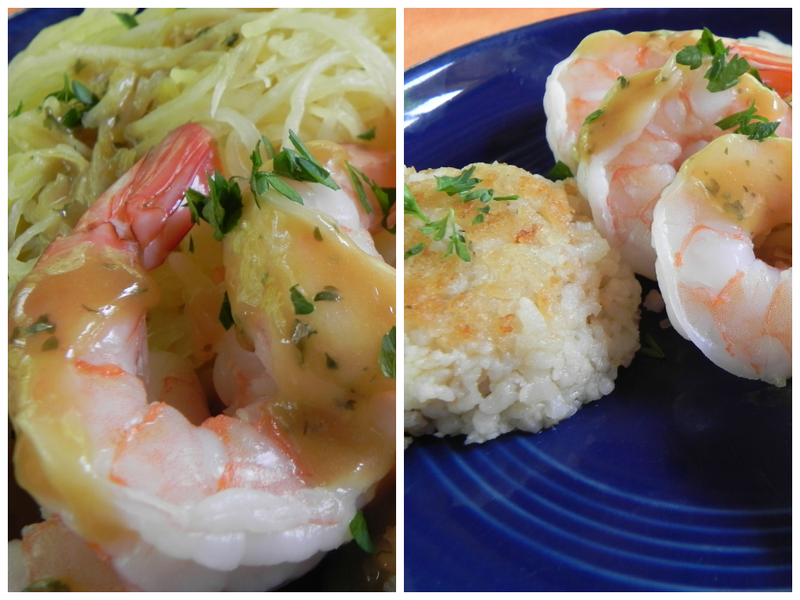 The atmosphere was totally Californian and my dinner, "Shrimp Scampi" was so, so delicious! Everyone agreed that the dish I ordered was the best one, so I tried to duplicate it here. 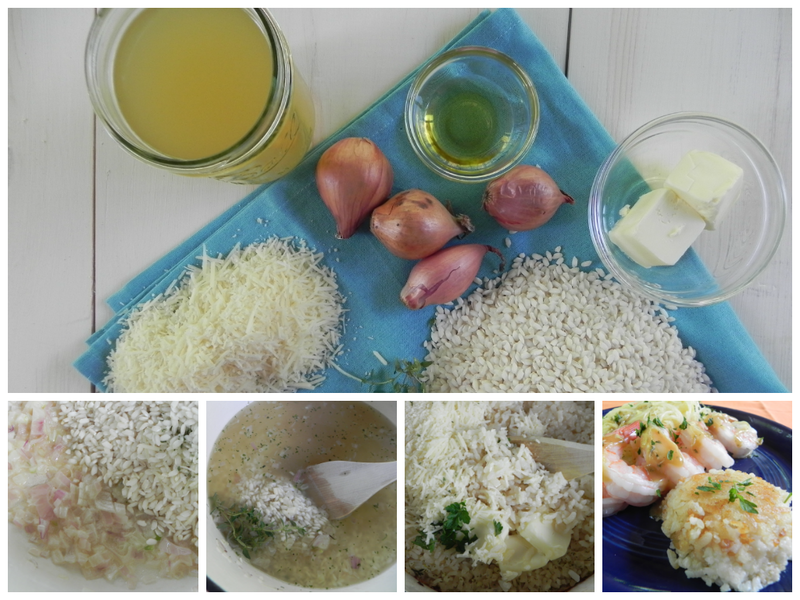 It is responsible for making me fall in love with spaghetti squash and risotto cakes - they are great with just about anything - especially shrimp with this citrus garlic sauce. I used frozen precooked jumbo shrimp and just warmed them up by popping them in boiling water for only one minute. I do have to mention that using homemade broth or low sodium broth and unsalted butter is a must; otherwise it will be just too salty to enjoy it. In a dutch oven, saute shallots in the olive oil until soft. Add rice and garlic and stir for 30 seconds. Add 4 cups of the broth and wine. Cover the rice mixture with a sheet of foil and then put the top on the dutch oven. Bake for 45 minutes in a preheated 350 degree oven. Take it out and stir in the cheese, remaining cup of broth, and butter. 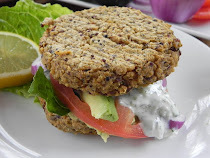 Let the risotto cool a bit, then make 12 patties and set aside. Melt 2 tablespoons of butter in a skillet over medium low heat. In batches, brown the risotto patties about 5 minutes per side. Cut one large spaghetti squash lengthwise in half. Scoop out the sides and the darker stringy stuff. Put a couple of inches of water into an baking dish and place the squash halves skin side up into the dish. Bake at 350 degrees for 45 minutes. Remove from oven. With a fork, remove the strands of squash from the skin by running the fork from top to bottom of the squash. Use a vegetable peeler to peel off an inch wide piece of both lemon and orange peel. Use a sharp knife to scrape off any pulp that is on the flesh side of the peel. Place the 2 tablespoons of oil in a pan along with the sliced garlic, lemon peel, and orange peel and saute over medium heat until the garlic begins to brown. Remove and discard the garlic and the peels. Add the broth, chervil, and thyme. Turn the heat up to high and allow the broth to come to a boil. Then turn the heat down and let it simmer for 5 minutes. Add the butter and whisk it in until it melts. Cook over low heat for two more minutes, then add the parsley. 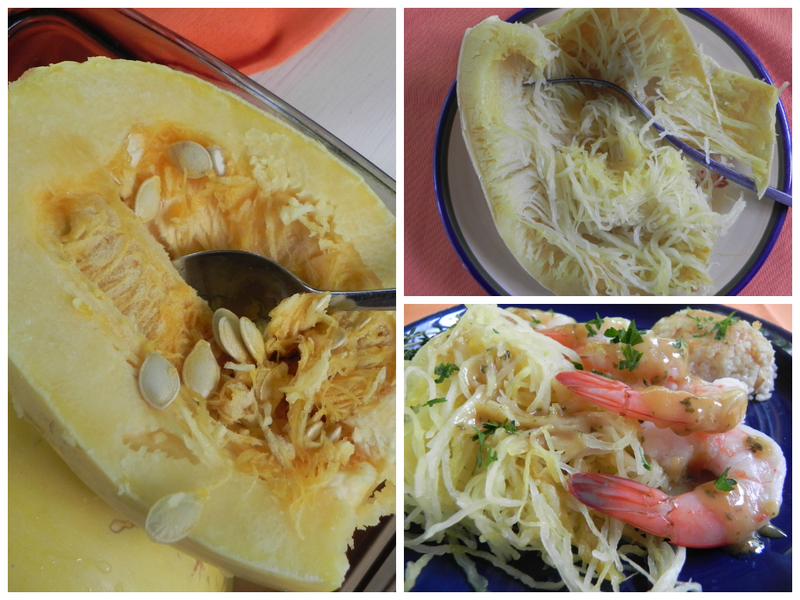 Divide the cooked spaghetti squash among four plates. Place a risotto cake or two on each plate. Divide and arrange one pound of cooked jumbo shrimp on the plates. 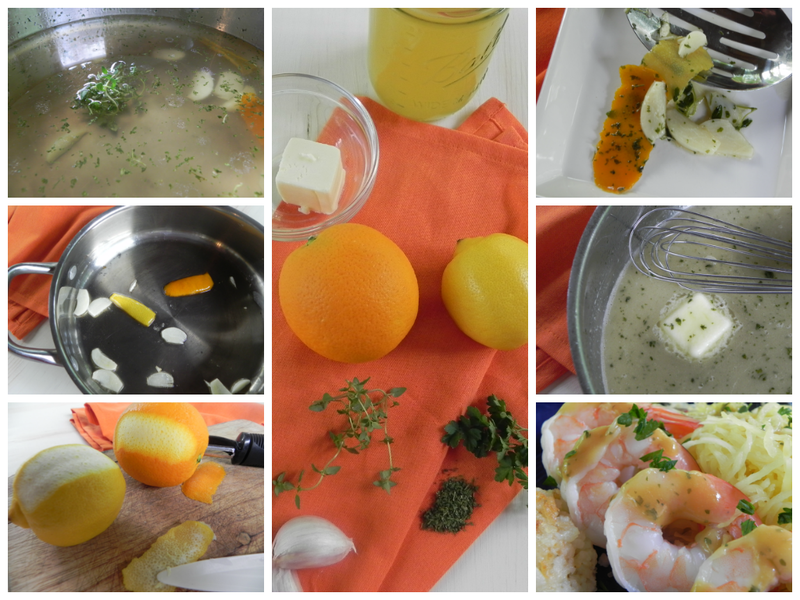 Drizzle the citrus garlic sauce over the shrimp. Sprinkle with additional fresh parsley to garnish it.